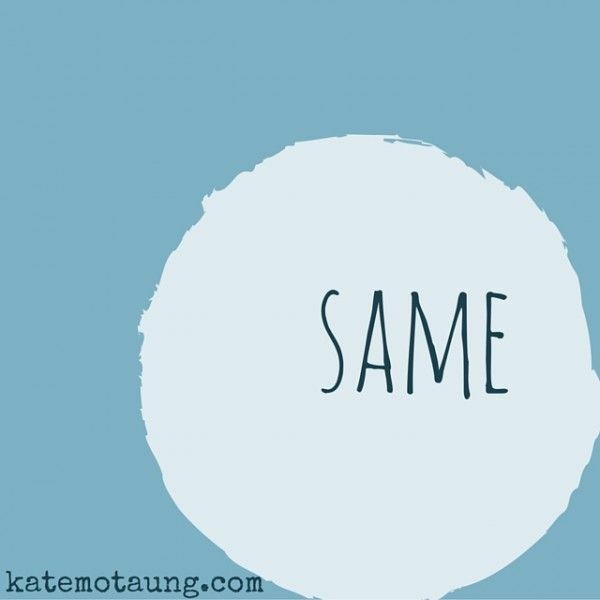 same is today's prompt for Five Minute Friday at Kate Motaung's place— we get to write unedited for five minutes. Someone said consistency – sameness – is the last refuge of the unimaginative, yet in some places and some settings, a degree of sameness can be helpful and highly functional. For example, although people change all the time, and no one remains exactly the same from moment to moment, I find my own consistency and sameness interacting with people usually serves me and them well. The community on ministry / candidacy committee's only caution on my psychological assessment was that I had "overdeveloped skills in reconciliation, accommodation, and peacemaking." Notice I've even memorized what they said and wrote!? I'm pretty much expert at calming ruffled feathers, helping all involved parties see and appreciate other viewpoints, etc. Then again, there are ways in which I so wish things in my own life did not continue to be so almost exactly the same. Yet another same type of rejection; the same or very similar responses to my ongoing attempts to volunteer, participate, and contribute. So other people tend to be almost as much the same as I tend to be? In many ways my "number" – my modus operandi, my sense of call that won't quit, my sense of direction – hasn't changed; it's still the same. I never can go back exactly the same way I traveled to get here to where I am today, yet I can return to the dreams, I can recast those dreams, I can reinvent *my* dreams, so they're still the same, yet with more than a hint of different. Hi there from your FMF neighbor at #53. I loved your post. I too, am a natural peacemaker. I feel we would get along swimmingly after reading your post. Lately I have been seeing that we cannot stay the same, though we long for the comfort of what we know. Just like we cannot crawl back into our mother's arms, we cannot stay the same, but continue to grow. Thank you for sharing life in your words this week! what an interesting post. Staying the same, yet changing our course to reflect the newness within us. I am a FMF neighbour.